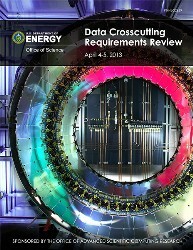 Now available from the Department of Energy's (DOE), Office of Advanced Scientific Computing Research (ASCR), Data Crosscutting Requirements is a report resulting from the ASCR-sponsored workshop held in April 2013 to assess data requirements associated with DOE-sponsored scientific facilities and large-scale experiments. PNNL was a major contributor toward fulfilling this report. The effort united experts from across the DOE Office of Science, including facilities staff, program managers, and scientific experts from the offices of Basic Energy Sciences, Biological and Environmental Research, High Energy Physics, and ASCR. Together, they assessed three distinct aspects of the data challenge: processing, management, and analysis by examining scientific drivers, crosscutting computer science and mathematics challenges, and global themes. Their discussions generated five specific findings and four recommendations summarized within the report. PNNL was a major contributor to the organization of the workshop and the finalized report, especially CSMD's Associate Division Director, Kerstin Kleese van Dam, who facilitated the workshop and honed the final report, and Shannon Colson from PNNL's graphics department, who designed the piece. The report is available for download via the ASCR website at: http://science.energy.gov/ascr/news-and-resources/program-documents/.